» GMO dilemma: How to vote? GMO dilemma: How to vote? … and this is the other. But there’s obviously more to it than signs. I’m glad I don’t get to vote in Southern Oregon’s Jackson County even though I use its roads to ride my bike. I would have a hard time making up my mind about the citizen initiative that would ban the growing of GMO crops, meaning genetically engineered or modified organisms. 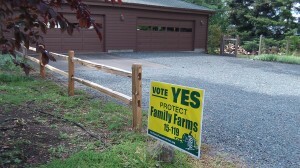 The proponents claim to be protecting family farms. The opponents make the same claim. One side or the other will claim victory when the primary election ballots are counted on May 20. 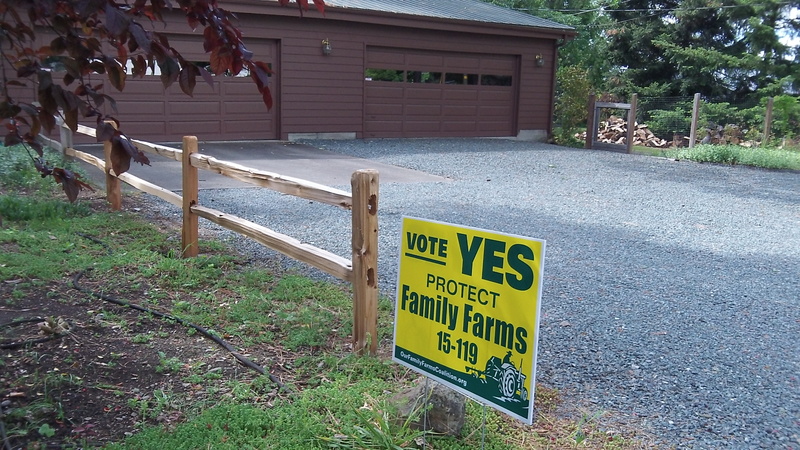 The proponents of Measure 15-119 include organic farmers and, judging by the “yes” signs in a suburban section of Medford, a good number of people with gardens in their yards. Reading their campaign material online, the one charge that sounds plausible to me is that banning GMO crops is the only way for non-GMO crops to be protected from contamination. If your business depends on selling organic produce, having some GMO pollen waft over your fields in a springtime breeze could probably wipe you out. You may remember when Oregon wheat was blocked from being exported to Asia for a while because somebody discovered a genetically modified variety in an Eastern Oregon field. Another instance: Canola or rapeseed is banned in part of the Willamette Valley because its pollen might affect similar plants nearby. So genetic contamination is a real concern. Backers of the initiative also worry that if, through no fault of their own and in fact against their wishes, their crops come to have a patented gene, they might be subject to legal action by the corporation that owns the patent. Or at least they could not, without violating a patent, use part of their harvest to plant next year’s crop. So the initiative backers have legitimate points. The opponents do too. They point to details in the proposed ordinance that could be used to drive commercial farms out of business. One provision that struck me as particularly odious is that individuals or groups could enforce the ban by bringing suit, but the ordinance would not allow winning parties to get judgments to recover the cost of litigation. GMO opponents organized as interest groups funded by donations could sue every grower in sight on suspicion that they harbor banned plants. The farmers would bear potentially ruinous costs, but even if they win they lose a lot of money and perhaps their farms. This is unfair and should not be allowed. Paulette Bouvia Pyle replied via Facebook: The Organic farmers are actually angry with a company in the area that grows sugar beet seed. There are two crops that have seed in the same family, chard and beet seed…and the truth is that inadvertent presence in the card from the sugar beets does not harm organic certification. However, if the pollen from chard gets in the sugar beets, that crop is ruined. Unfortunately for the beet seed company, the organic growers deliberately moved their chard next to a beet seed field and dug up the chard screaming foul when the company growing the beet seed offered to buy the chard crop to stop the chard pollen from contaminating their crop. When the chard grower was asked if he tested the chard before digging up, the answer was no. There are serious unintended consequences, if the measure passes, all Round Up Ready alfalfa growers in Jackson county who have nothing to do with this fight will have to dig up their crops. RR Alfalfa doesn’t contaminate any crop…but a lot of farmers will again be spraying their alfalfa crop with an array of chemicals to control the weeds vs one time with Roundup. Bottom line, the organic farmers want to have the voters render Jackson County as an “Organic” only bCounty. With the pesticide preemption law passed in the mid nineties by the legislature that won’t be possible. But what will be possible, at least in the short term, many farmers outside of the chard/sugar beet fight will suffer serious economic loss any way they choose to fight the new law…lawsuits are expensive and digging up the crop is a very long term expensive proposition. Without doubt the effected growers will file lawsuits against the County to stop enforcement via the Right to Farm and Forest law. 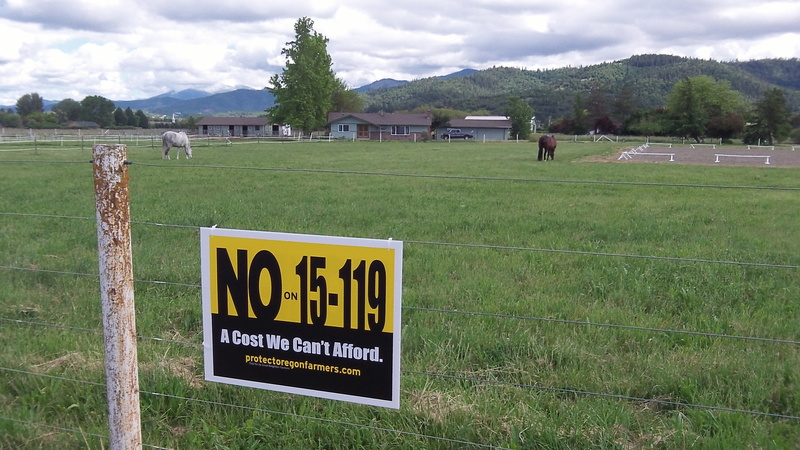 Had the Organic farmers wanted to work with any grower in Jackson County, coexistence would have been a reality, but that would not have benefited their agenda. There will be serious unintended consequences, if you read the definitions section of the measure, for the Organic farmers. The one thing that will save them is when the Jackson Co Farm Bureau and Stockman challenge the measure in court should it pass. Unfortunately, this will be an expensive proposition for both the County and the farmers. As you can see, this is more complicated than is possible to explain in a campaign…. RoundUp is killing people with the disease it causes – why on Earth would we want to have RoundUp Ready crops? Grow the real-deal, organic food only and leave our weather alone, and we’ll all be a heck of a lot better off. Just say NO to GMO, please learn more!